This weekend has been as non-stop as always. In a push to keep the momentum from my intensive Spanish course going I've spent a few hours in a cafe reading through National Geographic and have been pleasantly surprised that it's not been too much of a struggle. On top of this I've had a bunch of programing to do and a paper from a collaborator to read pre-publication. Plus, of course, the healthy dose of couchsurfers descending on Romero Donallo. 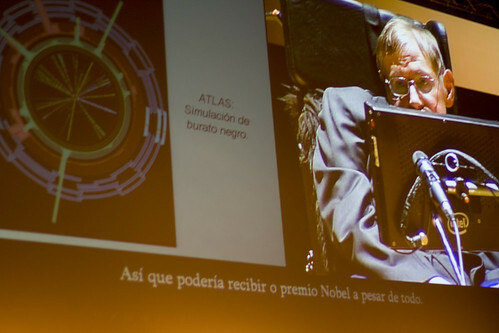 However, the big event of the weekend was the public seminar of Stephen Hawking in the Palace of Congress which began with Hawking being presented with the Fonseca Prize for the Popularisation of Science. 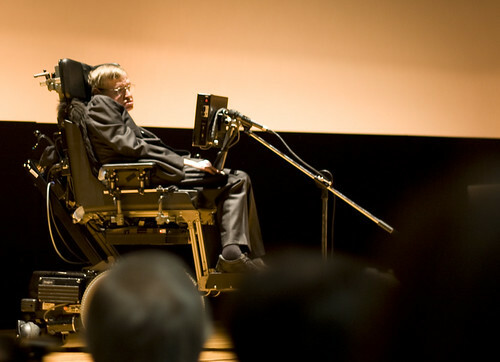 The talk was on black holes and was pretty well given and received. Nothing terribly unexpected, though there were a couple of tongue in cheek remarks as Stephen layed claim to the Nobel prize (this slide clearly taken out of context!). Thus it may still be possible that I receive the Nobel Prize after all. And here is a snap of Stephen mid-seminar. We were lucky to be very near the front, as the 1500 seat palace was fully packed! A non-stop week lies ahead!